Famous for winning the battle of Mobile Bay where he is credited with saying "Damn the torpedoes. Full steam ahead!". 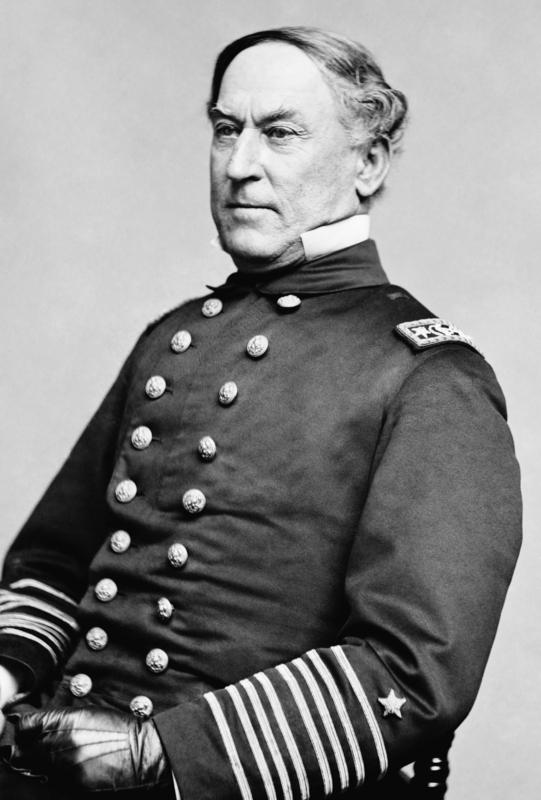 Farragut is simply the most quoted naval officer of the Civil War. He was also one of the best. He'd entered the U.S. Navy at the tender age of nine, as a midshipman, and had his first command at twelve. (It was only as a captured merchantman, but he was still very young.) He ground his way up the slow promotion of the peacetime Navy, serving on shore, in the Caribbean and the Mediterranean. When the war started, the Navy needed to prune some of the deadwood of ancient officers; Farragut was one of the board seeing which could still breathe. In 1862 he was put on active duty, commanding the West Gulf Blockading Squadron and also the expedition that captured New Orleans. He bombarded the forts for a bit, then realized he could simply steam past them ' so he did. Cut off from supplies, the forts surrendered and he proceeded upriver. The Confederate defenses of the city were disorganized; more things could have been finished if fewer had been started. On April 25 New Orleans, the largest city in the South, surrendered. Not only had the South lost a major industrial city, but they couldn't ship any of the cotton from the Mississippi basin. It also gave the Union a base to blockade the Texas and Mississippi coasts. Farragut received the Thanks of Congress and a promotion to rear admiral. From New Orleans he operated up the Mississippi, trying (and failing) to take Vicksburg. He had more success on the Texas coast, closing the ports of Galveston, Corpus Christi, and Sabine Pass. Balked at Vicksburg, he took Port Hudson, the last Confederate strongpoint on the Mississippi. When he returned to New York, he got a hero's welcome from the public.